Most of my professional life has been devoted to telling stories for and about teenagers. But after my novels The Fault in Our Stars and Paper Towns were adapted into movies, I pitched the producers (Temple Hill) and studio (Fox 2000) of those movies a somewhat different story, about the greatest underdog sports story you’ve never heard, starring a bunch of middle-aged people with absolutely no athletic talent. And today, an agreement was announced, so I wanted to drop by Medium and explain why my next film project is about not American teenagers but a lower league English football club. So, okay: In May of 2002, the English Football Association gave the owners of a club called Wimbledon F.C. permission to move 70 miles away, to a town called Milton Keynes. Despite fervent protests from Wimbledon fans, the FA decided that it was “not in the wider interests of football” to have a club based in Wimbledon. Wimbledon fans call themselves “Wombles” after a popular British children’s show. 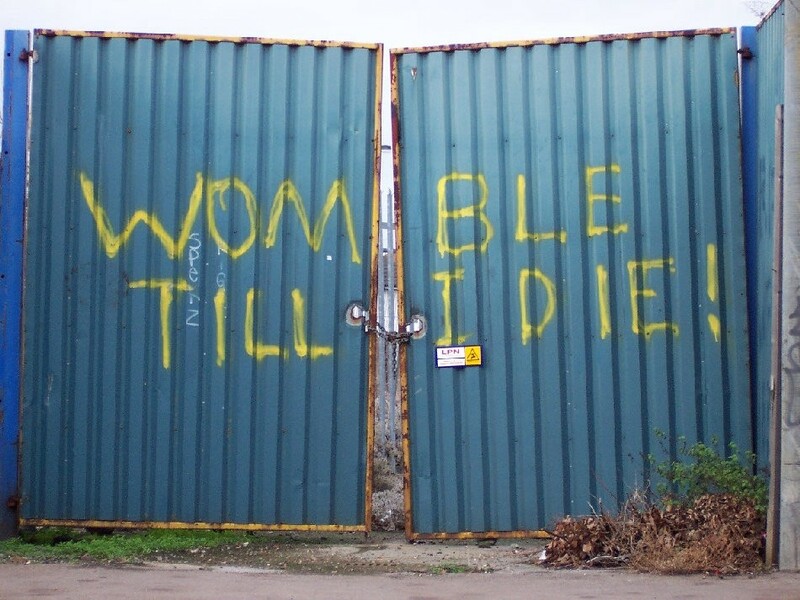 Despite the defiant graffiti and protests, it appeared Wimbledon would be without a football club until a group of supporters decided they would just start a team. Of course, there were some initial challenges — for instance, none of them had any experience running a football club, and they also had no uniforms, no sponsors, no coaches, and no players. And then a funny thing happened: They started winning. In fact, between February 2003 and December 2004, they didn’t lose a single game. They bought a small stadium, and got promoted to the eighth tier, and then the seventh. They rebuffed wealthy investors, preferring to remain fan-owned, even if it meant never getting back to the Football League. By 2011, just nine years after forming, AFC Wimbledon had worked their way back to the fifth tier of English football, just one promotion away from the Football League. They made it to the playoffs, and then to the final, where the game went to a penalty shootout. The Dons’ 19-year-old goalkeeper Seb Brown saved two penalties. And then Wimbledon’s captain, Danny Kedwell, stepped up to take the final penalty. In his 10-year career, Kedwell had never played a game in the Football League, and with one penalty he could take himself and his club there. What happened? Well, watch the video with commentary from the volunteers at Radio WDON. And so it came to pass that a bunch of middle-aged people with normal jobs and no idea how to run a sports team founded a club that, in nine short years, rose through the ranks of amateur soccer and became a professional Football League club. Today, Wimbledon are 10th in League Two, and their plans for a new stadium in Wimbledon are well underway. And off the pitch, they continue to be a progressive force — AFC Wimbledon were the first club in England, for instance, to take a stand against homophobia. 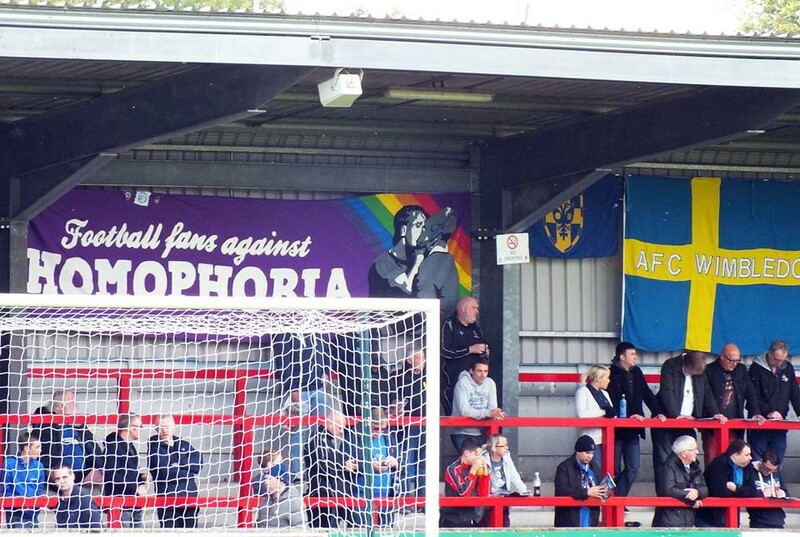 Anti-homophobia banner at a recent AFC Wimbledon match. By choosing community over profit, and by reminding us that hope is necessary even when it is also preposterous, AFC Wimbledon has shown the world the way to Plough Lane. Football is a game where adults can sing together and cry together, a rectangle upon which we can see in manageable scale all that is good and terrible about people, all the injustice and folly and joy of human life. And when that rectangle was taken away from Wimbledon, they built it again, That resilience represents the very best of us, and I am so excited to be part of the team working to share that story with a wider world.